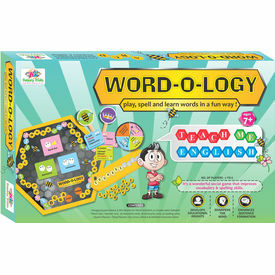 Play, Spell and Learn word in fun way ! Each Player passes through all the 26 alphabet positions on the hexagonal game board. The task is to from a word starting with the Alphabet which the player is attempting. The word are formed on mini boards with the help of double sided plastic alphabet tiles. 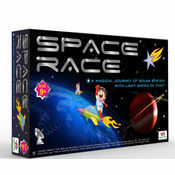 The points earned by the player for that particular alphabet depends upon the length of the word formed by the player. Longer the word higher the score. If any of the players feels that spelling formed by a player is wrong, he can raise an objection by asking the quiz master to review & ascertain the correctness of the spelling. If the word is found to be true, the player who had raised the objection loses 5 points, but if the objection is found as valid the player who had raised the objection earns 5 points while the player who had attempted to from the word loses 5 points. A correct answer is indicated by the quiz master by raising the ' crown' placard & a wrong answer by raising the ' Bee sting ' placard. At 6 locations on the game board ( after alphabets D,H,L,P,T,X) player has to spin the pointer and perform the task as indicated by the pointer. These include answering the Synonym, Antonyms or Spelling card. Synonym & Antonym card have multiple choice answer format. The game thus progresses completing all the alphabets from A to Z. 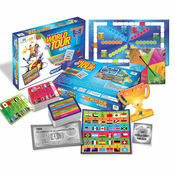 The player with highest score at the end is declared as the winner and gets the Toy Crown.